Volume lashes – coming soon! Eyelash extensions are a product that lengthens and thickens your own lashes. Each single strand of a synthetic eyelash is placed onto your own natural lashes with a waterproof, medical adhesive which helps creates a natural, beautiful look. Our clients love that they feel natural and lightweight and are great to wear for everyday or just for special occasions. A full set of eyelashes can take anywhere from 1.5 hours to 2 hours depending on your lashes and the look that you desire to have. 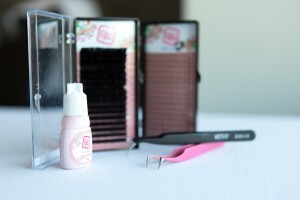 Eyelash fills take approximately 45 minutes and mini fills take approximately 25 minutes. No this is an absolute myth. When they are applied correctly and properly, they are safe and do not ruin the health of your natural lashes. It is important to ensure your lash extensions are applied by a qualified lash technician with a professional, quality product. Remember to treat your lashes with care. If you do pull out your lash extension and your own lash pulls out you do have to wait 30 to 45 days for your natural lash to grow in again. Can I still swim, shower, exercise while wearing the eyelash extensions? Yes. We use a waterproof bonding agent which allows you to shower, swim and exercise. However, we do not recommend you get them wet or wash your eye area for 24 to 48 hours after your eyelash application. If you wish to still use a mascara, use a water based mascara and apply from the middle of your lash out. Your lashes will look amazing without mascara. Wake up with your lashes looking like you are wearing mascara all day and night without the smudging and clumping. However, if you still desire to wear mascara, use a water based mascara and apply from the middle of your lash out. Can I perm or curl my lashes? This is not recommended at all. You will not have to because you will have a gorgeous lovely curved shape. Using a mechanical eyelash curler, will shorten the life of your eyelash extensions and may even cause damage to your lash extensions and your natural lash. Best to avoid caffeine so you can relax during your appointment. Most of our clients fall asleep. Who cannot wear eyelash extensions? Eyelash extensions can last up to 6 weeks depending on how well they are cared for. However, they are no longer full at 6 weeks. For most people, a lash fill is usually required every 3 to 4 weeks. The extensions will shed along with your natural lifecycle of your own lashes. Your own natural lashes have a lifecycle of 30 to 45 days.